The Custer County Republican was the first publication of Broken Bow, founded by R. H. Miller on June 29, 1882, around the time of the initial platting of the city. During its thirty-nine year run, the paper was published and edited by a long list of individuals, including Miller (1882-87), D. M. Amsberry (1887-89, 1896-1906, 1908, 1911-13), C. E. Shea (1914-16) and James K. Hewett (1916-20). Under their direction, this paper served as one of the most influential publications in Custer County, Nebraska, until it was absorbed by the Custer County Chief on January 20, 1921. Though a daily section did exist for a short time, the paper's schedule was predominantly weekly, printed on Thursdays. The periodic daily editions, inconsistent in their schedule, included the Broken Bow Daily Republican (March 21 - December 18, 1888 and June 10, 1892), the Daily Republican (December 21, 1891), and the Daily Evening Republican (May 9, 1898 - July 26, 1898). The paper offered three subscription options: $1.50, $.85, or $.50 for twelve, six, or three months respectively. Focusing the majority of its attention on local Custer County affairs, the Republican ran regular reports from Broken Bow, Georgetown, Dry Valley, New Hope, Mason City, and other surrounding communities. 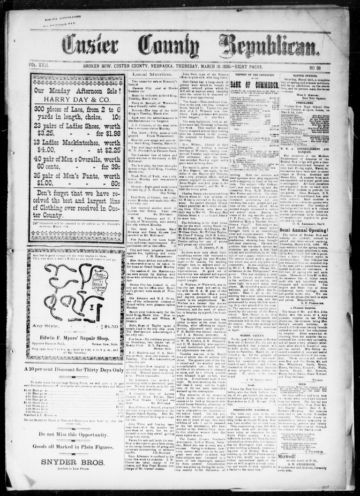 The Republican started in 1882 with a four-page, seven-column format but would later alternate between eight and six columns, and expanded to eight pages per issue on June 25, 1885. As its name suggests, the paper supported the Republican Party and regularly gave voice to Republican campaigns and initiatives through editorials, general event reporting, and even political cartoons in the early 1900s. The paper also informed local residents of national Republican Party events and news. Aside from promoting Republican political agendas, the primary reason for the Republican's existence was to report on and publicize regional agricultural and economic affairs. In particular, writers regularly extolled the virtues of Custer County soil and the various reasons why people should settle there. In an editorial entitled "Nebraska Dirt," the Republican wrote, "[W]e are asked why is it everybody is going to Nebraska. We suppose because it is fashionable, and people wish to be fashionable." They continued to praise the region's year round agricultural bounty and therapeutic effects the environment had on residents' health. Considerable space was also used to report on local social happenings, community events, Masonic lodge news, and information on other county groups. The Republican's masthead started in a bolded, all caps font and later alternated between a more stylized calligraphic title and simpler bold text fonts.